Dining out as just a couple has of late become rather rare since the arrival of Baby Clonc, so when the offer of babysitting from my folks was made we quickly snapped at the chance. That's not to say we didn't spend most of the time talking about Baby Clonc anyway! Lunch times often work best for our situation so on this particular rainy Sunday we decided to head to Arbennig for our date. Now I must confess that this is not my first visit to Arbennig but what that does give me is some insight into consistency which really is as important as making a good first impression. The family run restaurant headed up by John and Ceri Cook has just celebrated their first year of opening and what a year they have had. John had previously been head chef at Oscars of Cowbridge then took over the Pontcanna branch of Oscars last year and together with his wife Ceri rebranded and relaunched as Arbennig. Since they opened their doors last year they seem to have gone from strength to strength with the highlight surely being named as the highest ranked restaurant in Cardiff according to the Good Food Guide 2015. The restaurant based in the Pontcanna area of Cardiff has an understated and calming atmosphere when you enter. The large restaurant is split over two levels and is light and airy without feeling cavernous. There is a little snug area near the bar for a drink before dinner or lunch and benefits from having a car park also. Arbennig have a menu that changes weekly and helps to reflect their ethos of using the freshest ingredients when they are at their best and are whenever possible locally sourced. 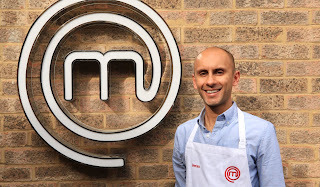 This also allows Chef John to get creative and you can see that on the menus that are updated weekly on twitter and more recently their own App (they have an App, I don't know many restaurants around Cardiff that have their own App). As mentioned we dined on a Sunday, therefore it was a set two course for £13.95 or three courses for £15.95, so three courses it was to be! However that wasn't enough for me. I had noticed that John had posted on twitter a bread creation which I wanted to try. Although not on the menu for today my wish was granted by John and I had the pleasure of trying what can only be described as the best cheesy garlic bread ever. Warm, soft bread topped with Snowdonia Cheddar and wild garlic. Not only did it taste great it looked the part with the vibrant green of the wild garlic. On to the starters, Mrs Clonc went for one of my favourite dishes, calamari. This particular incarnation benefiting from buttermilk to tenderise the squid and accompanied unusually by guacamole and more usually by sweet chilli. It looked fantastic presented on a matte black plate, Mrs Clonc very kindly let me try a bit. The crunchy coating giving way to soft squid was delicious, the hint of sweet chilli was welcomed but the presence of the guacamole was lost on us both and did not really enhance the dish. Regardless of this Mrs Clonc said it was one of the best calamari dishes she has had in recent memory. I went for the smoked beef starter which I was drawn to because it was accompanied by kohlrabi a vegetable I had not tried. Thin strips of peppery and lightly smoked beef in a salad of bitter leaves, parmesan shavings and the afore mentioned kohlrabi but pickled. An interesting combination that again looked beautiful and was well balanced. The pickled kohlrabi providing a sharpness to cut through the beef and parmesan. Thankfully my choice was very light and I was very much ready for the main course, Mrs Clonc was already showing signs of waning from the three course plan. After wanting to go out for Sunday lunch for some time Mrs Clonc only wanted to consider the beef brisket with all the usual roast dinner accompaniments. Again Mrs Clonc allowed me to try some. Ridiculously tender locally sourced beef brisket that you could have eaten with a spoon, crispy roasties, perfectly cooked vegetables, an epic Yorkshire pudding and a delicious gravy, what's not to like? I decided against the roast dinner and opted instead for the lamb tagine accompanied by saffron and olive risotto. I personally think I made the right choice. Real food for the senses, it looked superb and smelled amazing. Meltingly soft ribbons of again locally sourced lamb, delicately spiced and sweet on a rich bed of bright yellow saffron and olive risotto. The taste of saffron coming though but not overpowering and a scattering of pistachios for texture. For me this dish was a joy to eat both comforting and satisfying on this cold rainy day. As mentioned Mrs Clonc had already shown signs that the three courses may not come into fruition. However I decided to plough on while Mrs Clonc looked on with a tea instead. Rhubarb and apple crumble with gingerbread ice cream was to close the meal for me. I think by now you have gathered that good presentation is a given. A chunky layer of crunchy bolder like crumble covering sweet and sharp rhubarb and apple with a ball of gingerbread ice cream. As crumbles go it was good but the gingerbread ice cream was too delicate in flavour for me a bit more gingerbread flavour would have been good. And before you ask, yes Mrs Clonc tried a bit. At this point I was waving the white flag of surrender, however the chocolate truffle that accompanied my americano was quickly seen too. Put simply we had a great lunch. As mentioned before this was not my first visit and I'm glad to say that I have enjoyed every visit to Arbennig as the food, service and general atmosphere has always been good and has not disappointed. A special mention here for the service which is always impeccable and the price point for their fixed menus which I believe to be great value for money. The Sunday lunch menu we had for example and the two course weekday lunch at £12.95. The price for the evening al a carte menu does however ramp up quite a bit more. For our lunch including three glasses of very nice wine (great by the glass selection available) and a couple of hot drinks came to £51.90 without tip. I think its fair to say that I like Arbennig a lot. A family run restaurant with the ambition of serving great food in a relaxed environment with great service and attention to detail. Every neighbourhood would be over the moon to have a restaurant like this, I'm just glad its in my neighbourhood. If you haven't booked anywhere for valentines day yet or don't fancy going out for dinner or simply don't buy into the whole hoopla then I may have the answer for you. I have come up with a delicious two course meal which is easy to prepare yet makes a real impact to wow whoever you wish. First up for mains is my take on a classic, I've called it a 'Wellington' for the sake of brevity but in actuality it is a lovely braised blade of beef wrapped in puff pastry served with a sauce made from the cooking liquor and accompanied by the bang in season purple sprouting broccoli. This dish is as delightful to eat as it is to look at. I've used a cut of beef here called blade of beef or feather blade of beef. It's a more unusual cut but can be found in all good butchers. It needs to be cooked long and slow but is delicious. The recipe can be preprepared well in advance. Don't worry about the length of the recipe it's totally worth it! Heat a good glug of olive oil in an oven proof casserole dish or pan on the hob until almost smoking hot (you can do this in a frying pan if you wish then transfer to an oven proof dish) then add the beef and colour until golden brown on all sides to seal the meat. At this point I remove the beef from the pan and turn down the heat slightly then add the prepared vegetables and cook until softened and starting to pick up some colour. I next add the herbs and the sealed beef back to the pan, turn up the heat and add the wine to deglaze the pan. Cook for a few minutes to burn off the alcohol then add the beef stock, you need enough liquid to cover the beef add a little water if you have to. Pop a lid on the pan and transfer to the oven and cook long and slow for 3 hours. After this remove the beef from the pan and set aside and allow to cool fully, the beef should be very tender. Strain the cooking liquor with a sieve over a new pan to separate the vegetables and herbs from the liquid, this will form the sauce to serve with the beef. Next up the dessert and for me there is nothing quite like chocolate to finish a meal, I mean who doesn't like chocolate? This gooey chocolate dessert is very unctuous and decadent. It's my take on a classic Nigella dessert but I've adapted the recipe to make it as straight forward as possible with easy measurements and to make the perfect amount for two. Preheat an oven to 200c/gas mark 6. In a bowl over a simmering pan of water melt the chocolate and butter together making sure the bottom of the bowl does not touch the water. Once melted together set aside to cool. In a separate bowl, mix together the other ingredients until well combined. Then mix in the cooled chocolate butter mixture into the egg, sugar and flour mixture until well combined. Spoon into ramekins and bake on a tray on the middle self of the oven for 15 minutes or until you notice the tops start to crack as you can see in the photos. For this dessert try and use the best chocolate you can get as it really does make a difference. I like to serve this with some crème fraiche as it cuts through the richness of the chocolate really well, alternatively some vanilla ice cream would also be brilliant. This can easily be made in advance and popped in the fridge until ready to bake. There you have it, my two course valentines day menu. I love both these dishes individually but together they make a fantastic special occasion meal. Please do have a go at making it and let me know how you get on. A close friend of mine recently asked if I had any nutritional tips to help with his training for the forth coming Touch Rugby World Cup to be held in Australia where he will be proudly representing Wales. As I'm not a nutritionist I couldn't possibly recommend anything without any qualifications to back up my suggestions but what I have come up with is this easy to make energy bar that will at least provide an energy boost pre or post training. Aside from that it makes a great snack or a lunch box filler. What I can say nutritionally is that the mixture of high and low GI (glycemic index) foods should provide some fairly quick energy release initially from the dried fruit, banana and honey, followed by slowly drip feeding more energy to keep you going from the oats. Other nutritional high points include cholesterol lowering properties from the beta- glucans found in the oats and omega 3 found in the linseeds. The bars can be made gluten free by using gluten free oats and the dried fruit can be changed according to preference i.e dried apricots and dates. I have called it an energy bar but technically it is a take on a flap jack, the difference to me is really in the final shape you cut it to be. Preheat the oven to gas mark 5 (190c) then grease and line a baking tin (approx 33x24cm). Spoon the mixture into the tin and even out as best as possible. Bake on the middle shelf for 15 mins uncovered then a further 15 minutes covered with either a sheet of tin foil or baking paper to prevent the top layer of fruit burning. Allow to cool on a rack then remove from the tin and peel away the baking paper. Stored in an air tight container the bars should keep for approximately one week. While I make no promises that this energy bar will improve your sporting prowess, what I can say for certain is that it is really easy to make and tastes really good. There is something so inherently satisfying about steak. Call me boring but for me a perfectly cooked steak (harder to find than you think) is a thing of beauty. The taste, texture and the physical aspect of eating it somehow speaks directly to my inner Neanderthal man! 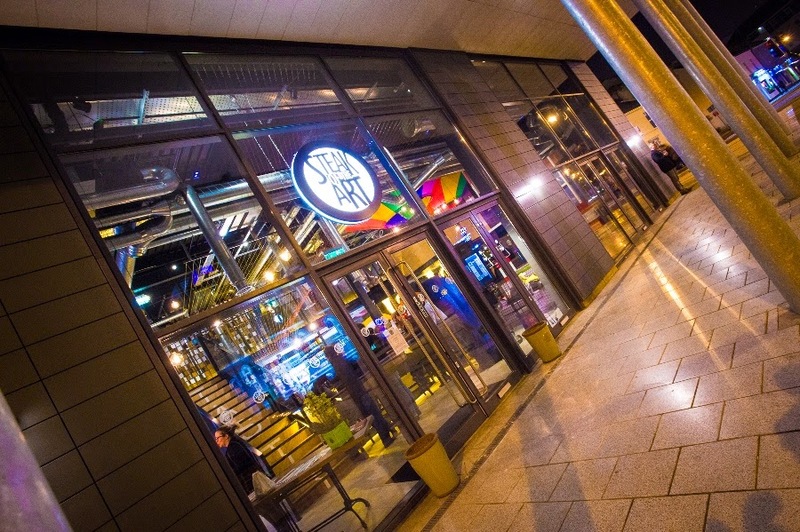 So it was of great interest to me that Steak of the Art were venturing over the bridge from their first restaurant in Bristol to set up their second in Cardiff. Steak of the Art, which opened last week, aims to serve delicious food, that is reasonably priced but in an environment that fires up the imagination. The concept is the brain child of classically trained chef and entrepreneur Steve Bowen. The Bristol restaurant by all accounts has been a success and on enquiry with my friends who live in that neck of the woods the response is generally very positive. 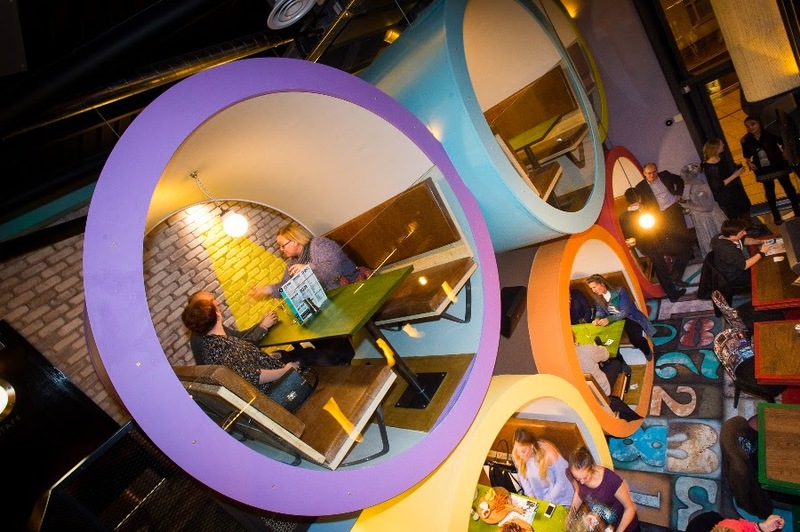 The Cardiff restaurant based on Churchill Way is a large 150 cover space, featuring unique booths for up to 6 diners to enjoy their food. 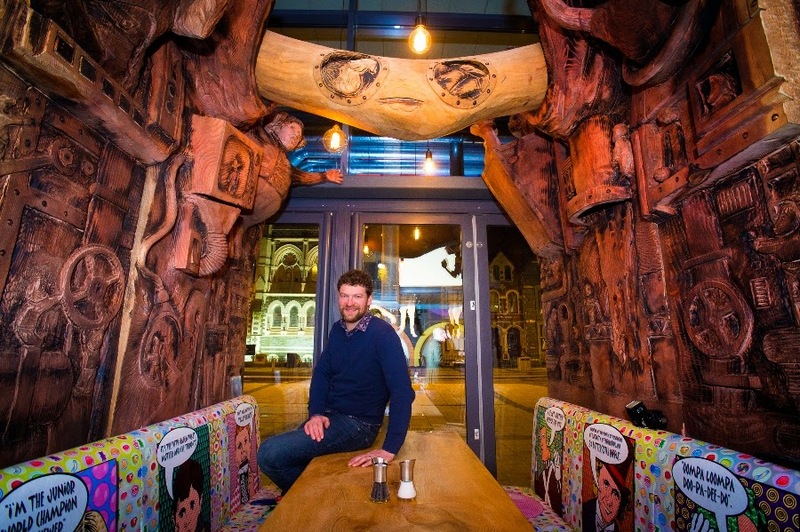 These include a Willy Wonka inspired booth, carved out of a single tree trunk by Welsh based champion wood carver Simon O'Rourke, surely the booth for all those looking for a bit of Augustus Gloop style gluttony. 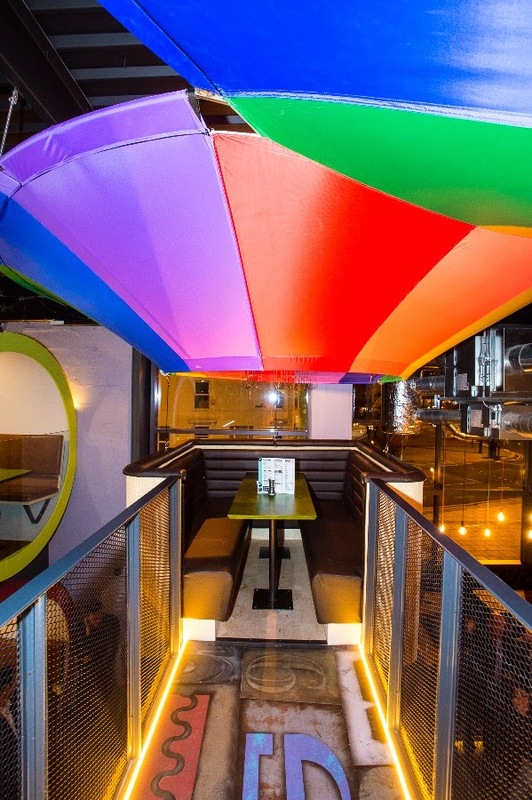 Additionally on the mezzanine level there are two hot air balloon booths which 'float' above the main restaurant, a nod to their Bristol background, the home of the famous Bristol International Balloon Fiesta. I personally love the look of the brightly coloured tube like booths, stacked three on three which provide such a striking image. In addition to this there will be art on display to buy. As the name of the restaurant suggests steak is at the forefront of the menu, however there are other options. The feel of the menu suggests quite an informal affair with sharing boards for starters and a mixed grill option for the mains. This 'Ronseal' approach i.e "does exactly what it says on the tin" will ultimately mean it is the steak which they will be judged on. I think it is fair to say that Steak of the Art will be a welcomed addition to the ever improving Cardiff food scene and I cannot wait to visit the restaurant not only for the food but for the restaurant itself. 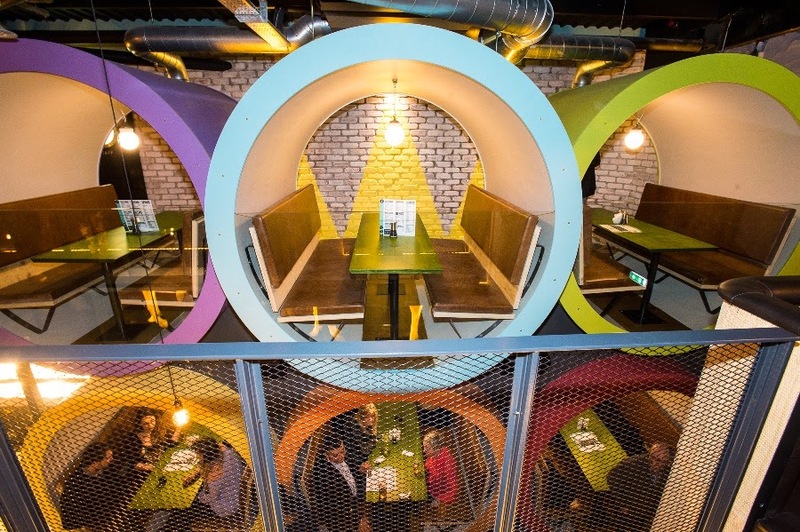 Lets hope the food is as good as the restaurant looks, only one way to find out! Photos courtesy of Empica Ltd.